Baghdad (Agenzia Fides) - A delegation of Christian politicians belonging to various Iraqi political groups wanted to meet the country's top institutional representatives to focus their attention on proposals and requests for the reconstruction of North-Iraqi areas freed from the self-proclaimed Islamic State (Daesh), and especially regarding the future political and administrative structure of the Nineveh Plain. On May 3, the group of five Christian politicians, including Iraqi parliamentarian Yonadam Kanna (Secretary General of the Assyrian Democratic Movement) and Romeo Akari (President of the Bethnahrein Party), were received by President Fuad Masum and Salim Abdullah al Jaburi, President of the Iraqi Parliament. The politicians - who presented themselves as representatives of the "Christian component" - submitted a list of requests to their interlocutors regarding, in particular, the implementation of the political guidelines - already approved by the Iraqi Parliament in 2014 - aimed at granting greater administrative autonomy to the Province of Nineveh, where the traditional territories of Christian Christian communities are concentrated. 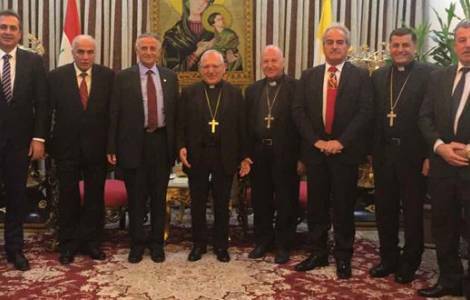 Among the proposals outlined by Christian politicians there is also a proposal to seek and obtain an international resolution that guarantees the protection of the demographic balance of the Nineveh Plain and the commitment to protect the populations of that area from sectarian violence.